Our friends at RifleShooter.com like to slice and dice — barrels that is. They have done barrel length cut-down tests for popular calibers like the .223 Rem, 6.5 Creedmoor, and .308 Winchester. 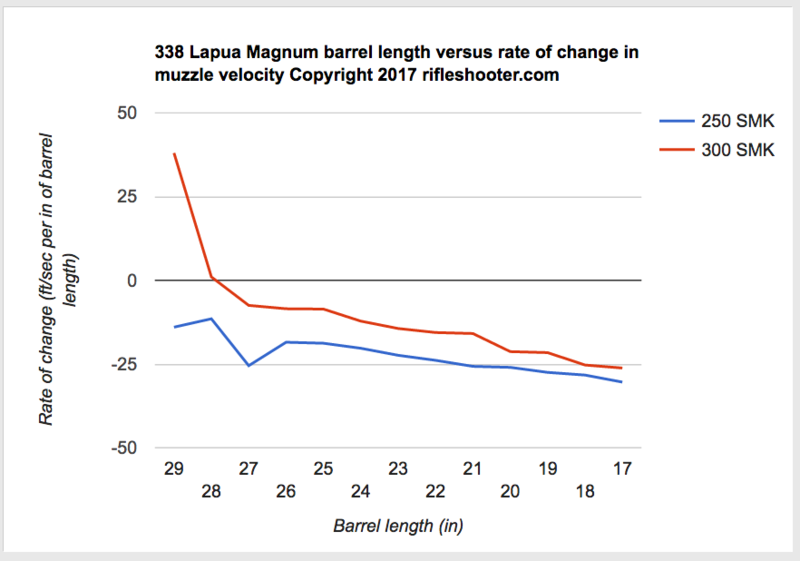 But now they’ve tackled something way bigger — the .338 Lapua Magnum, a true “Big Boomer”. Starting with a beefy 30″-long Pac-Nor Barrel, RifleShooter.com chopped the tube down in one-inch increments all the way down to 17 inches (that’s 14 different lengths). At each new (shorter) barrel length, velocity was measured with a MagnetoSpeed chronograph using two different loads, 250gr SMKs with H4831sc and 300gr SMKs with Retumbo. Four shots were fired at each length with each load, a total of 112 rounds. Load #1: 250gr Sierra MK, Lapua brass, CCI #250 primer, H4831SC, OAL 3.720″. Load #2: 300gr Sierra MK, Lapua brass, Win WLRM primer, Retumbo, OAL 3.720″. After shortening the barrel from 30″ to 17″, total velocity reduction for the 250-grainers was 395 FPS, an average loss of 30.4 FPS per 1″ cut. The amount of velocity loss per inch rose as the barrel got shorter, with the biggest speed reduction, a loss of 55 FPS, coming with the cut from 18″ to 17″. *Velocity rose with first cut. Velocities ranged from 2,871 FPS (29″) to 2,492 FPS (17″) for a total velocity loss of 341 FPS. We highly recommend you read the whole story. Rifleshooter.com put in serious time and effort, resulting in solid, thought-provoking results. The data is presented in multiple tables and graphs, revealing inch-by-inch velocities, change “deltas”, and SDs at each length. Share the post ".338 Lapua Magnum Barrel Cut-Down Velocity Test"
There are still some openings left for the June 2017 Williamsport 1000 Yard Benchrest School. “If you have been considering long range competition, come on out and learn from some of the top shooters in the game. This school will take years off of the typical learning curve.”– Eric Wolfgang, Original PA 1000 Yard Benchrest Club Secretary/Statistician. Cost for the class is $375.00 including lunches on Sat/Sun and dinner on Saturday. Don’t hesitate if you want to attend the 2017 school. For more INFO email Ray McKinsey, Joe Saltalamachia, or Eric Wolfgang via this Club Contact Page. This slideshow was produced by Sebastian Reist an alumnus of the 2009 Williamsport 1000-yard BR school. SEE: www.sreistphotography.com. Share the post "Learn Long-Range Skills at Williamsport 1K Benchrest School"